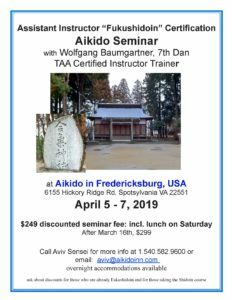 Upon satisfactory completion of this course, students will have acquired the essential knowledge and information and core minimum skills to become effective assistant-instructors of Aikido. This course focuses on the needs of a senior student or assistant-instructor who has some light teaching responsibility in a dojo, under the supervision of a Chief Instructor. The course includes a combination of 10 hours of mat work and 2 hours of lecture/discussion. Students’ interaction with the instructor is encouraged. Mat work includes: 􀀁 Identify and work on physical and energetic components of each technique 􀀁 Explore strengths and weaknesses of each technique 􀀁 Work on best way to present techniques to facilitate assimilation. Each student will be provided with a binder containing essential information that can be used for note-taking. Note that in addition to completion of this course, there are training and teaching experience requirements to complete the TAA Fukushidoin certification.